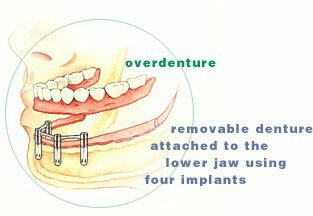 Ruth Weiss became increasingly dissatisfied with the dentures she had worn for several years. She could not chew comfortably because of a continuing problem with the stability of her lower denture, and she was constantly concerned it would slip out in public. After consulting with her dentist, they both agreed dental implants would be an excellent solution to her difficulties, and implant surgery was scheduled. Following the procedure placing four implants in her lower jaw, Ruth was permitted to wear her existing removable dentures home, which she continued to wear while new ones were being fabricated. Although she experienced "a couple of hours of mild discomfort" before falling asleep that first night, she reports waking the next day feeling no pain at all. Today, with her new dentures firmly in place, Ruth has renewed confidence in her smile and her speech. And because she is involved in numerous church and civic activities, she often appears before an audience both as a song leader and as a speaker. "They're well worth the investment," Ruth says of her implants. "It's just a marvelous thing. I feel secure enough to even sit down and eat a steak."